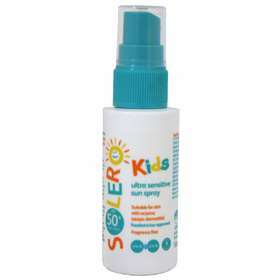 Solero Kids Ultra Sensitive Sun Spray provides your child with very high UVA and UVB protection for their delicate skin. This Ultra Sensitive Sun Spray for kids is a extra caring formulation which is suitable for skin with eczema and moisturises their skin to keep it hydrated, soft and supple. Apply the sunscreen before going into the sun and again 15 minutes sun exposure. Re-apply every 1-2 hours to maintain protection, especially after perspiring, swimming or towelling. A reduced quantity will lower the level of protection significantly. Even sunscreen with high sun protection factors do not provide a 100% protection from UV radiation. Although this product has been tested consumers individual reactions to the product cannot be excluded. Sunburn damages the skin permanently and therefore should be avoided. Over-exposure to the sun is a serious health threat. Avoid contact with eyes. Do not spray directly onto face or into the eyes. Ensure sunscreen product is fully absorbed. Avoid contact with fabrics and hard surfaces. Permanent staining is also possible after product is fully absorbed. Aqua,Octocrylene, Glycerin, Alcohol Denant., C12-15 Alkyl Benzoate, Butyl Methoxydibenzoylmethane, Ethylhexyl Salicylate, Diethylamino Hydroxybenzoyl Hexyl Benzoate, Diethylhexyl Butamido Triazone, Bis-Ethylhexyloxyphenol Methoxyphenyl Triazine, Dibutyl Adipate, Dicaprylyl Ether, Phenylbenzimidazole Sulfonic Acid, Triacontanyl PVP, VP/Hexadecene Copolmer, Tocopheryl Acetate, Panthenol, Microcrystalline Cellulose, Caprylyl Glycol, Sodium Hyroxide, Acrylates/C10-30 Alkyl Acrylate Crosspolymer, Galactoarabinan, Disodium EDTA, Cellulose Gum, Aloe Barbadensis Leaf Juice Powder, Caprylhydroxamic Acid, Tocopherol.